Have you ever considered what can easily bring a smile on your face? Exotic works of Zambia African art can bring a smile to your face. And a smiling face is a reflection of a relaxed mind. That is what art of Africa will do for you. Consider this! The phrase “tyranny of familiarity” is rather an interesting concept. Zambia African art being exotic and not exactly familiar does not fall under this idea. Take your home for instance. It can become too familiar because you see and feel it everyday. The home becomes a little different, perhaps a wee bit boring? That reminds me. Once a professor paused this question in class. Who has an advantage? A fish in water or a fisher? Where was I? Aah! ....the home is a bit different. The sight has become all too familiar because of the “tyranny of familiarity”. It requires “interior re-arrangement”, new decorations or pictures to be hang on the walls. A solution? 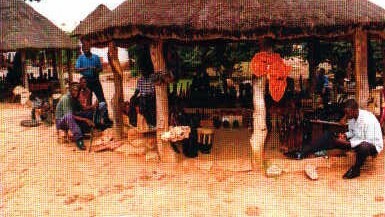 Zambia African art, the exotic handicraft or pictures, perhaps from real Africa? .. and the list is endless! You have a choice. You only have to say your wish and Presto! Voila! well, perhaps not quite like that. 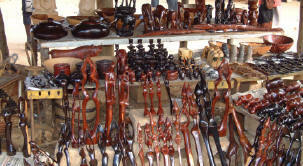 But these experienced craftsmen will put together whatever work of African art you like. They have been doing this for a long time, from time immemorial. They have tacit knowledge handed down from master craftsman to master craftsman. What is even more exciting is that these “copper pictures” alias copper-plate-embossed drawings can be seen being made on the roadsides. A picture measuring one square meter (3 feet by 3 feet) will take just a few days to make. Talking about exotic works of art, your choice does not end here. There are other forms of exotic works of Zambia African art you would want to consider owning. Well, they are rare so you would be proud to own one. They are hand-made and not mass-produced. You can have them custom made. “Canvas seed drawings”: The artist glues colored seeds individually on canvas to make a drawing of anything such as wild animals, landscape, people, etc. Since they require an artist’s total concentrations the outcome is lovely. Again you may ask for a picture of your choice. You can also see these “canvas seed drawings” being made on the roadsides. Artifacts, curios, figurines or carvings. They are made from many materials such as stone, wood or metal. Yet others are made from the malachite mineral, a stone with a beautiful deep green color. Decorative ornaments and hand-made jewelry from malachite and metals such as copper or brass. These are a real value to have. They range from trinkets, necklace, bracelets, rings to even earrings, all of course, are hand-made with an African art theme. Now what use are these African artworks. Their value is in their artistry and aesthetic. They are exotic, eye-catching and soothing. They will never stop to amuse you, to please you with their beauty. And beauty will put a smile on the face. A smiling face is a reflection of a relaxed mind and that’s what you will achieve. A restful rest in your own home! Get more information and learn a little about the people's culture and their art. 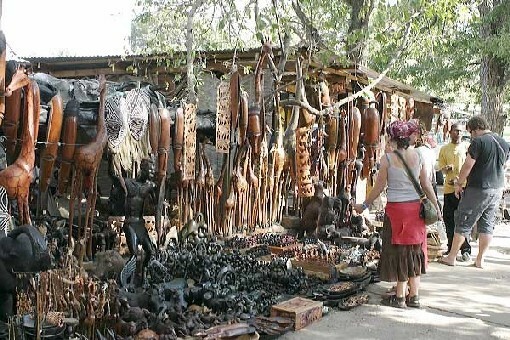 Visit the outdoor adventure the market place that depicts culture and Zambia African art.